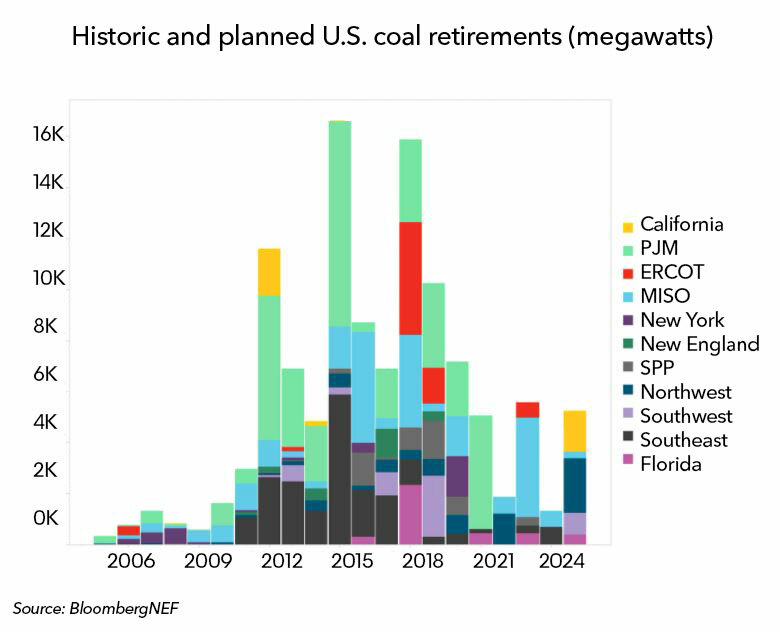 Twenty U.S. coal-fired power plants have closed or are expected to close by year-end, making 2018 the top year for coal retirements since environmental regulations helped shutter 17 gigawatts (GW) of capacity in 2015. This year’s widespread closures were headlined by the retirement of four massive Vistra plants in the ERCOT (Texas) market. Coal plants retiring this year produced 127,000 gigawatt-hours of electricity in 2017, enough to power 12 million homes. Replacing just half of that generation with natural gas could boost demand for the fuel by as much as 1.5 billion cubic feet per day. Fierce competition from cheap gas and zero-marginal-cost renewables will continue to drive closures, particularly in the Midwest and Mid-Atlantic regions. An additional 37GW, nearly a quarter of today’s fleet, are set to exit the U.S. market by 2025. BNEF clients can access the BNEF U.S. Power data hub on the Terminal or on web.